Dilihat dari sinopsisnya di Goodreads, sepertinya jenis ceritanya kayak Bliss. Tentang rahasia ajaib yang dimiliki oleh keluarga Finkle. Tapi rahasia ajaibnya bukan resep kue, tapi cuaca. Most folks say, "Mother Nature controls the rain." However this is not the case in the village of Finkleton. In the perfect little village of Finkleton, the weather is always perfect. Every farm grows the best, biggest, healthiest crops in the entire world, and everyone is happy. Soon after the Finkles inherit their Uncle Harry's shop and move to Finkleton, they discover magical secrets hidden in his shop. One clue at a time, Jack, Lizzy and Robert learn the town's amazing secret. No, Mother Nature is not in charge in Finkleton! Ever since Uncle Harry's death, the weather has not been cooperating. Farms are starting to fail. 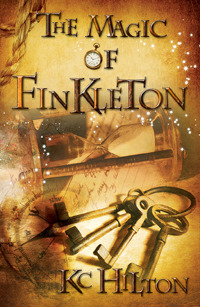 Will the Finkle children be able to solve all the magical mysteries before the village is destroyed? Come along to Finkleton. A very special, magical adventure is about to begin! covernya baguuuuus....sinopsisnya juga seru...jadi inget belom baca bliss. baca dulu ah ;p semoga terkabul ya ra!